This year we’ve been seeing a lot of military influences in the fashion world. These include epaulettes, parkas, long coats, nautical influences, and most prominently of all … khaki. Khaki is arguably one of this year’s most exciting trends for a simple reason: versatility. Khaki is a neutral color, which means it literally looks great with everything. Whether you want to wear khaki from head-to-toe for that strong militant look or you want to pair it up with a sequined mini-skirt, you will get a great effect. And best of all, khaki always cycles. It may go out for a few years, but it always comes back. That means that the same khaki garments you buy this year will come back in style again and again—so you can wear them for years. What should you know about khaki? Khaki is a color. It’s that yellowish brown used on military uniforms in the desert. The word “khaki” comes from the Indian word for “dust.” There is more than one shade of khaki. Khaki is typically made out of sturdy cotton, but can be other materials. Khaki may also refer to style elements from khaki uniforms, like cargo pants, lots of pockets, and so on. You can buy literally anything in khaki—trousers, shorts, skirts, jackets, even dresses. Let’s take a look at some of the most exciting khaki fashions you can buy right now on Amazon.com. This list features a mix of brand new designs fresh off the runway and popular and highly-rated fashions! Here are some classic khaki-colored leggings made from a combination of cotton, polyester, and spandex. The polyester and spandex allow the leggings to cling fashionably to your legs, emphasizing your figure, while the cotton gives you that classic khaki texture. The look is simple and classy, and would work great with a t-shirt for casual wear, or a blouse for business casual wear. As a bonus, if you like these khaki pants, you can also buy them in different colors. Looking for a shorter version of the leggings above? These khaki leggings are made of a cotton-polyester-spandex blend, and hug your hips beautifully! Five handy pockets give you plenty of functionality, while a rhinestone button and fly add some sparkle. These very affordable khaki leggings are perfect if you are searching for something for a junior. The close fit is comfortable and slimming. These pants are great for casual wear, but the knit is also just right for a work environment. Formal enough for school or for a work uniform, but casual enough for any other day. Cargo pants and khaki are two things that just go together! 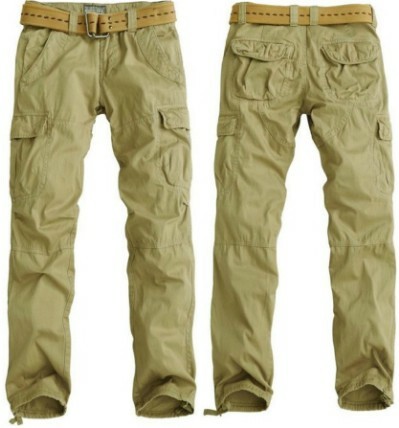 If you enjoy the looser, baggier fit and the handy pockets that go with the cargo pants look, you will love these. You can buy them in khaki and a range of other natural colors, and they are perfect for hiking and outdoor wear. They also make great casual pants for lounging around at home or doing just about anything. 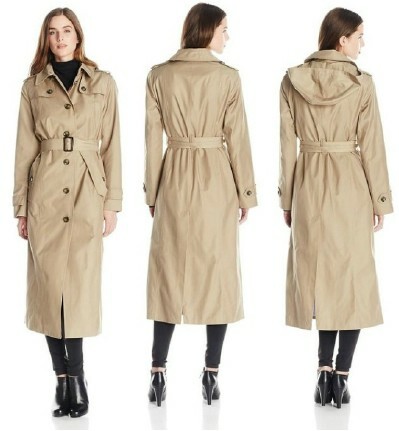 Here is a long single-breasted khaki trench coat, once again a classic khaki look, and very reasonably priced! Features include button-down gun flaps, shoulder epaulettes, and a removeable hood. Once again, you get plenty of pockets, a key feature in khaki fashion. This coat has received excellent customer reviews, and right now is averaging 4 and a half stars out of 5—quite a good rating for clothing. We love this coat because it is stylish, versatile, and captures that military sensibility which is so hot this year. If you like the khaki coat look, but you are interested in a shorter jacket, this blazer is an excellent choice. The style includes long sleeves, an adorable lapel, a high collar, and a waist belt. 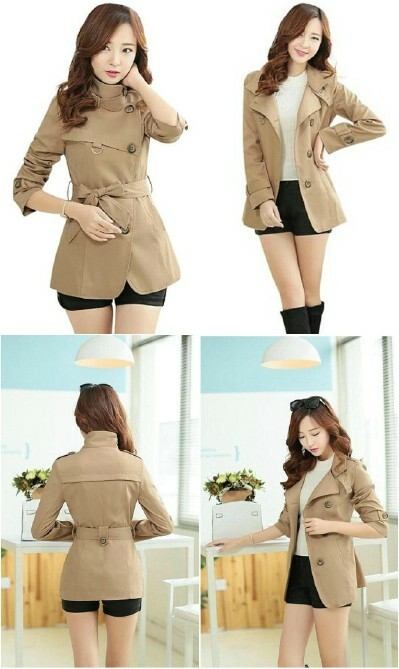 This would be a great jacket for everyday wear; it instantly dresses up any outfit, professional, or casual. Keep I mind that this look to be a Korean fashion, and it is designed to fit snugly. As a result, it may be a little smaller than you expect, so keep that in mind when you are selecting your size. If you don’t like the trench coat look at all and would prefer something completely different, here’s a short khaki jacket made out of warm padded nylon with a convenient zipper. While it’s not the best for snow or really cold weather, it is perfect for those cool in-between days where you want to keep the chill away but don’t want to wear something that’s too warm. 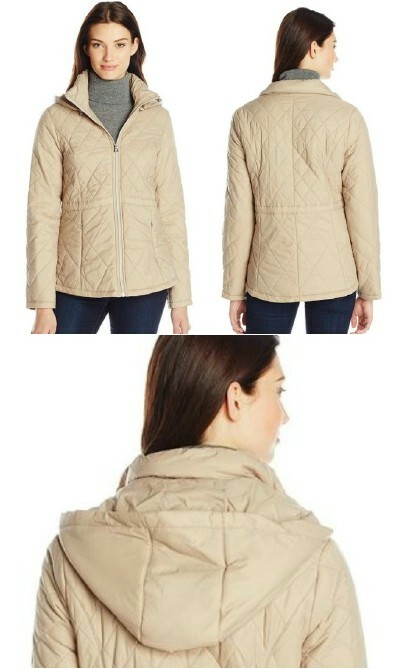 This jacket is really versatile and great for everyday wear! 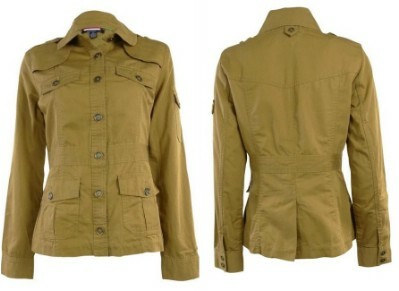 This military-style cotton jacket is the classic khaki look. You will notice that this jacket is a darker shade of khaki than many of the other garments featured in this list, almost an olive color. Khaki encompasses a range of different hues. This jacket is perfect if you want to get that military look. This slim casual khaki suit blazer is perfect for wearing to the office, but also works for casual wear. While it comes in a number of other colors, the khaki shade is definitely most suitable for the workplace, and matches anything! This blazer is a very popular item on Amazon.com, with more than 550 reviews as of the time of this post! It’s easy to see why. The blazer is form-fitting with a nice stretch to it, and closes with a single large front button. That makes it easy to take on and off, and makes it at once professional and flattering. Moreover, the cut is very comfortable. As customers point out, you can wear this to work without your movement being constricted, which is an advantage over many other blazers. Sizes run small, and most buyers recommend getting a size up. This is another garment which is available in a range of colors, but the khaki is arguably the most versatile and workplace appropriate! Khaki is great for creating more than just the military look. This shirtdress is perfect for spring and summer and allows you to embody a fun safari style which also appears partly inspired by some of the earlier jacket designs. The fabric belt gathers the garment at the waist to showcase your figure, and it zips up the front, making it easy to put on and take off. Simple and stylish, it’s a great way to dress this summer! Khaki may be a military fashion color, but it can be quite delicate, graceful, and feminine in a different context. This is a bridesmaids dress, but it’s also one of the most popular khaki clothing items on Amazon.com, and it’s very highly rated. The chiffon and satin gown is form-fitting across the top and fans out beautifully to flow below. While it’d of course make the perfect bridesmaids dress, it also would be great as a party dress for any formal occasion, and would also be perfect for something like prom or homecoming. This long plus-size dress has a crew neck cut and short sleeves, along with a satin natural waist band to emphasize your figure. The gauzy capelet includes beautiful beading and fringes, adding a glamorous accent to the whole ensemble. This dress would be great for wearing to a formal occasion, a party, or a night on the town. This khaki dress is a popular seller (also available in other colors), and perfect for a range of occasions where you want to look your best. The loose, flowing chiffon design makes it a perfect fit no matter what your figure is. You can wear it loose or belt it any way you like. The underlayer is cocktail length, which makes this dress more fun and flirty than conservative. A beautiful, elegant fashion that is sure to make a statement! As you can see, khaki isn’t really one specific color, which is something that regularly confuses buyers. 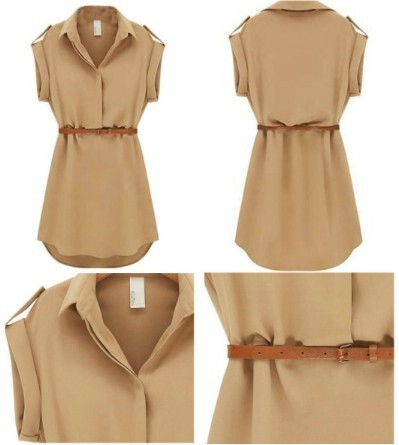 Khaki can range from a light taupe or tan to a darker color that looks almost olive, to a light, dusty brown—like this short-sleeve loose chiffon dress. This dress also captures that safari look from earlier with a thin decorative belt that gathers the fabric at the waist. A very cute dress perfect for those hot summer days. Note that these dresses are marked in Asian sizes, so you may need a larger size than you usually do. Looking for a great khaki pencil skirt which will be perfect for the office? This Forever Young skirt with side buttons is an exceptional choice for office wear, but would also be very cute for casual wear. It falls to your knee, which makes it just the right professional length. Even though it fits tight, it has a comfortable elastic waist. It’s available in a lot of different colors, including both light and dark khaki! For office wear, these shades are two of the best. Why? They’re neutral and unobtrusive, and that makes them great for even the most conservative workplaces. This cotton skirt falls just a couple inches above the knees, and would also be suitable for office wear. The hook and eye closure in front keeps the look clean and simple. 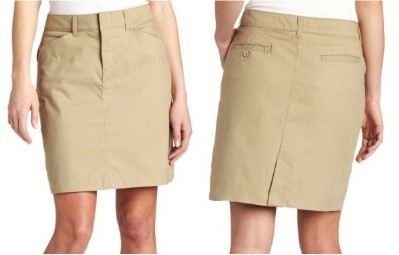 Pockets add functionality, and even though the skirt has a straight fit, it has been tailored to offer ease of movement and plenty of room for comfort. For this reason, it would be great for everyday wear as well as workplace wear! Looking for a khaki maxi skirt instead of a short skirt? This fashionable dress extends 40” and should fall to right around your ankles. It’s made of a soft blend of polyester and rayon for a cozy, comfortable fit, and includes four fully lined pockets. It’s a very popular product with high ratings. Ladies love this skirt because it’s comfortable but still flattering. This skirt is ideally suited for casual wear or weekends out and about. Buyers do mention that the khaki shade is darker in person than it looks in the photo (close to a light brown color), so keep that in mind if you are purchasing. If you’re expecting, gone are those days when you had to settle for practical maternity wear that didn’t offer anything in terms of style. This fashionable A-line long skirt drapes down to the floor and includes an adjustable elastic waistband. As far as maternity wear goes, this is a great choice. Why? Because it’s warm and comfortable, and you can wear it anywhere and look great. And because it’s khaki, it matches everything. You don’t want to stock up on a ton of clothes when you’re pregnant—unless of course you plan to do it again soon! So it makes sense to buy a skirt like this which you can get a lot of wear out of! It adds functionality and fashion to your maternity wardrobe. 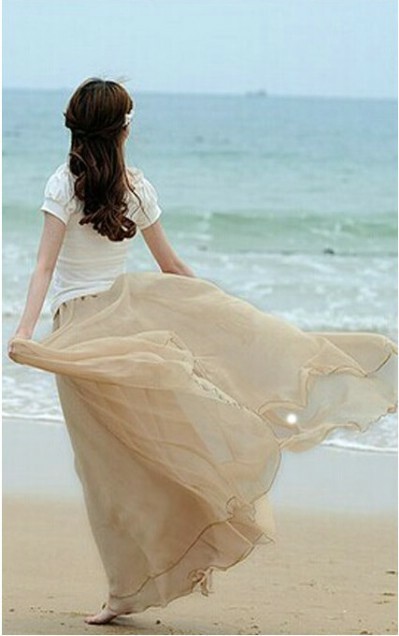 If the bohemian style is more your thing, you will adore this flowing chiffon beach dress. This dress looks so light and ethereal! It’s available in a number of different colors, but this is a dress where khaki works particularly well. The light color complements the light, flowing design of the dress perfectly. It’s an outstanding deal as well, because it ships from overseas. Be sure you check the size measurements before you buy so that you don’t end up with a size too small. As you can see, khaki fashion is versatile, fun, and easy to match up and pair with anything. You can wear it casually at home, out to a formal party, or to work. 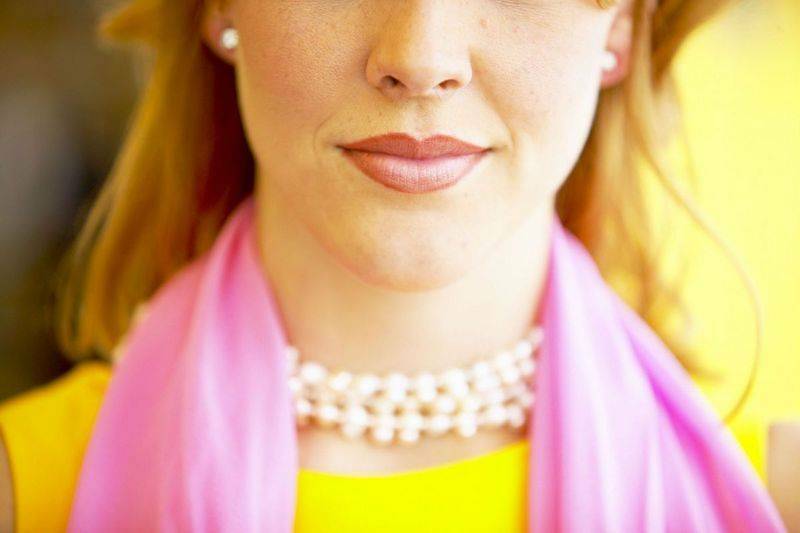 In fact, it’s ideal for professional wear because the muted, neutral colors are conservative enough for the office. There is a reason khaki comes back again and again, and never really goes out of style. But this year it’s bigger than it’s been in a long time, so enjoy your khaki leggings, skirts, dresses, blazers and more in 2015!